Just wanted to say that this is a great board to use with a Pi Zero. The 5v VCC will power the board and the I/O is at the 3.3v that the Pi needs. Just connect up VCC to pin 4, GND to pin 6, RXD to pin 8 and TXD to pin 10 and use your favorite serial program to connect at 115200 baud. This also works with other Pi boards as well, though I'm not sure if the bigger boards can source enough power from this cable or not. Would this work with the Propeller P8X32A Breakout ? When I got this product I was surprised to see a sparkfun logo molded into the boot. You guys are getting fancy. How long have you guys had these things? I'd suggest moving them to a broader prototyping category for sure. They're damn convenient for a lot more things than just arduino. I don't think you meant to hide them from the rest of us. Someone in catalog noticed this comment. I haven't heard of any issues with this particular product before. From our tests before with this product (including several other FTDI chips populated on boards), they should be populated with genuine FTDI chips. will this cable work with a beaglebone black? Yes - Be sure to align pin 1 of the cable which is the black (ground) wire to pin 1 on the J1 Serial Header which is designated by a white dot. You donât have to worry about the 5V Vcc on pin 3 of this FTDI adapter as pin 3 on the BBB is not connected. Works great with my old YellowJacket boards. I also note that on my Beablebone Blacks (the reason I bought 2 of these) the power not connected so you can happily use these with the BBB. Will this show up as an FTDI device when USB is plugged in, even if the breakout side is not plugged into anything? On the Redboard for example, it will show up specifically as a UART IC, but that's because it is wired in that configuration. Does that mean it wouldn't be recognized if it wasn't connected to any external circuit? This is an excellent interface cable that is easy to use with very flexible end-user configurable options. Just one precaution, though. Don't change to the external clock setting. It has no external clock components and the cable will be rendered useless, as it is at least. I intend this cable as an interface to program JP1.2/3 remote controls. And, in that use the 5VDC VCCOUT is of no consequence. The VCCIO lines supply 3.3VDC TTL signals. When I needed it, it was on sale for $11 and at that price it was a fantastic deal. So will this be able to register serial communication from an Arduino Mega's alternate serial ports properly? 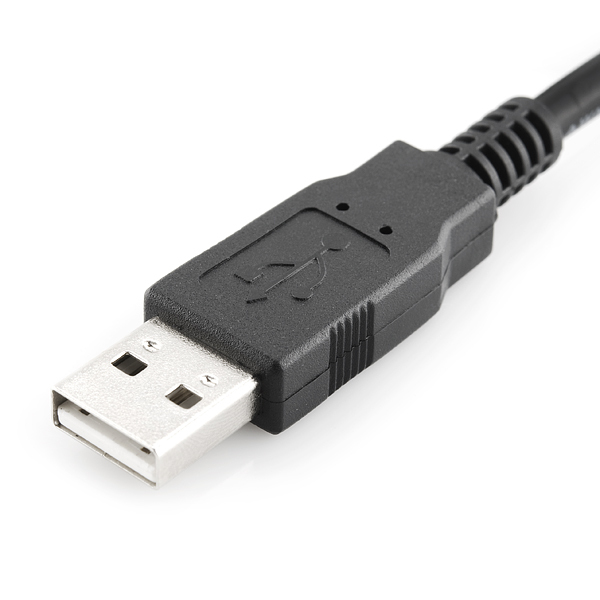 The Mega runs at 5V logic, but I was wondering if I could use this cable to simply pipe the output from my Mega's Serial1 port to my computer's USB port. What's the point of this cable? Why are you selling it?? I just fried a $40 sensor because any sane person would assume that a cable labeled/moulded 3.3V would deliver 3.3V Vcc. Hi , i didn't understood if the cable is compatible with arduino pro mini or the "FTDI Basic Breakout"
will it work with arduino pro mini as it is or i would need to connect another capacitors and resistors? Can you check the schematic link ? Taking a quick peek at the ft232r datasheet ( http://www.ftdichip.com/Support/Documents/DataSheets/ICs/DS_FT232R.pdf ) it states that any IO must be below VCC+0.5V. Does this mean that I can connect it to a 5V i/o device or are the levels too low for that? It seems to me like I shouldn't be able to damage the cable, since there are 10k resistors between the 3.3V regulator and the UART pins. edit. Saw the other question on 5V, however, I'm still curios of where the problem is. I need a usb to ttl cable. I need RX, TX, GND and the most important: a pin to control ZERO CROSSING, since my purpose is to connect a pc through usb to XM10e (ttl-cmos) and so be able to send X10 commands through europe wire system. The X-10 transceiver will provide you with a zero-crossing detection signal, which you'll need to synchronize your transmission to. You could use the CTS line on this cable to get that signal back to your computer. Since you're a noob (nothing wrong with that! ), be aware that this kind of "raw" X-10 communications requires a bit of timing finesse to pull off. To make your life easier, you might look into other X-10 transceivers that handle more of the job for you, such as the Powerlinc modem from Smarthome. (This is for US power systems, but you may be able to find the same or a similar product for Europe.) Good luck! It would be nice to have a version terminated with the type of jumpers that will fit on header pins. Since these are 3.3 v they are likely used with development boards or custom boards. Ideally, there would be six jumpers having the same colors documented in the schematic. An adapter jumper that would mate with the existing inline connector would also work. I made my own but did not have all the right colors. is this good to use with 3.3v board and 5v board? This is for 3.3V logic boards, for 5V you need to go with the 5V cable. You can use an FTDI Basic and utilize the solder jumper on the back to switch between 5v and 3.3v. I can't get this to work. w7 keep throwing "Windows has stopped this device because it has reported problems. (Code 43)" at me. what's wrong with that cable? nvm,problem found. My embeded USB hub in the front pannel is busted. threw it to the back one and it's fine now. n00b? : if I want to program an atmega328 on a breadboard do I use this? Or the ftdi cable? Or both?? Same questions if I am trying to program an arduino pro mini? Yes, you can use this. This IS the FTDI cable. You could use this or the FTDI basic. They both do the same thing, they are just in different form factors. And yes, same question and answer for programming a pro-mini. So I have been using this cable with my Fio, and I just noticed with this plugged in the 3v3 pin on shows 5 volts. Is that a problem? I see above that it mentions this cable won't damage Arduino Pro, which is also 3v3 for vcc, right? Is the 3v3 mainly just important for the level on the rx/tx lines? The El Cheapo solution would be a resistor divider, the true solution would be a regulator. Both of which are going to be tough to work elegantly into the cable. Can I use this cable to configure an Xbee PRO? Is it possible use for bit-bang programming? Dont make the same mistake i made! 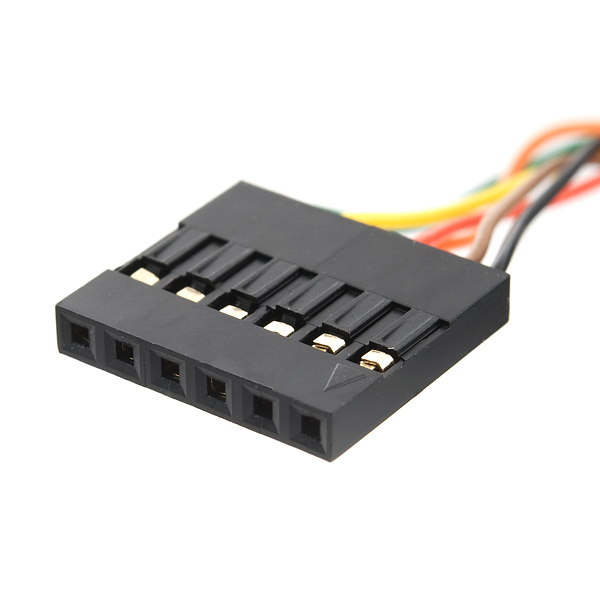 get a voltage regulator if you plan to use this cable with a 3.3v device!! Great cable, a bit expensive. 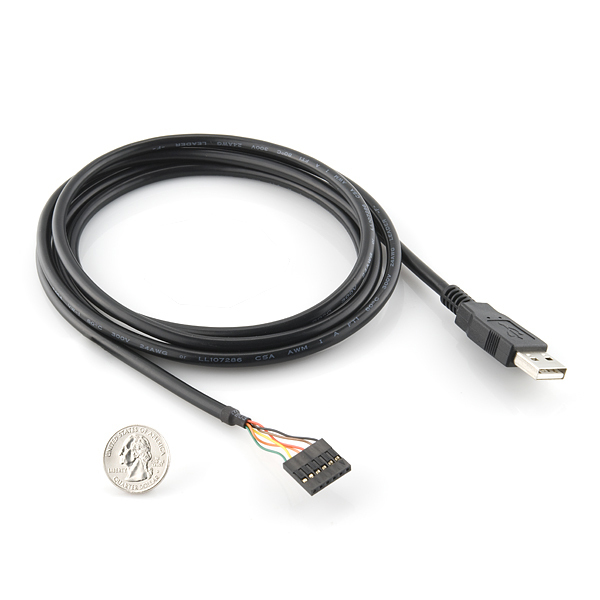 I'd put this cable at just okay especially if you compare it to the other ftdi cables and boards Sparkfun sells. cons: 1) You can't power a 3.3v device from it. 2) It's more expensive then the other sparkfun cables (eg CAB-12977 is half the price). It seems weird to me that you pay such a premium for having a few extra handshake pins broken out. Pros: 1) In spite of con the cons The fact that the handshake pins are there and the fact that the electronics are not exposed, making it a bit more durable is absolutely worth it for me. 2) The FTDI chip is much more reliable than the prolific chips, which I've had flake out on me. I got this to communicate with the Arduino Fio and have since used it with the RN52 breakout, and a few other projects. Has been handy as heck. The only downside i see in the future is that the wires going to the 6-pin connector are twisted around one another and seem to be the point that will ultimately fail. But I don't have a fix for it so i reckon they did as food as could be asked. It's an FTDI cable...need I say more? The cable works as advertised. I only wished that the power was at 3V3 like the logic. But that issue was described on the product page. I has several of these and will continue to buy them till such time as the power issue is corrected. Having proper 5V USB, but being able to communicate with 3.3V microcontrollers is hugely useful. Need a terminal for a Beaglebone or Arduino derivative as mentioned- but don't have the footprint/profile for the breakout board (it is possible...it's why I had to buy several of these gems over time...)? This is your answer to that "problem" with the breakouts. I bought this to use in conjunction with a BBB for BIOS flashing via SPI. Works great!